Chill out with this Mordecai and Rigby tin tote gift set. Includes tin tote, insulated container and set of 4 wood coasters. Special limited edition and individually numbered sets. Entertainment Earth Convention Exclusive! OOOOOOOH! Tired of working? Need a break? Then chill out with Mordecai, Rigby and, this awesome limited edition tin tote gift set from Bif Bang Pow!. The Regular Show Haters Gonna Hate Tin Tote Gift Set – Convention Exclusive is a limited edition of 1,000 sets and features your favorite park groundskeepers Mordecai and Rigby kickin' back and keepin' it chill. The tin tote measures 8 5/8-inches wide x 6 3/4-inches tall x 4-inches deep. 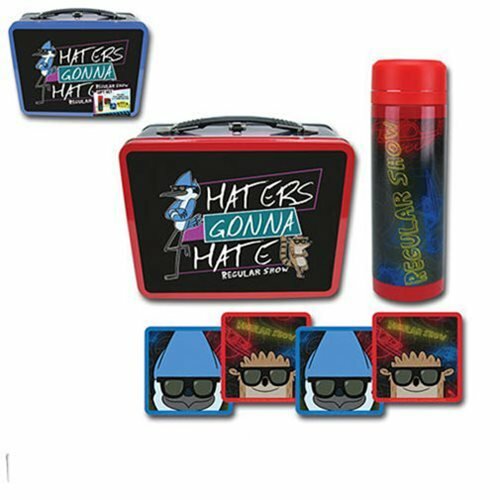 Mordecai and Rigby are shown with sunglasses next to the phrase "Haters Gonna Hate." Inside you'll find a 7 1/4-inch tall, 300 ml insulated stainless steel container; and a set of four 3 1/2-inch square coasters. Two coasters have Rigby with his sunglasses on and the other two have Mordecai with his sunglasses on. With Mordecai, Rigby and this gift set the surreal adventures will never end! Ages 14 and up. Mordecai and Rigby are best friends who spend their days trying to entertain themselves by any means necessary on the animated television series Regular Show from Cartoon Network.